I participated in an Ambassador Program on behalf of Influence Central for P.A.N. Cornmeal. I received product samples as well as a promotional item to thank me for my participation. If you like cornbread, you will love this pound cake recipe. When it comes to serving a brunch, what kinds of food come to mind? It’s a combination of breakfast and lunch, so something sweet is a must. To me, pound cake is a great addition to any brunch menu. The last time I experimented with P.A.N. Cornmeal, the cookies were a hit among many. I couldn’t stop eating them, so I shipped them over to Shelley’s house. They were gobbled up within no time over there. For my next culinary exploration, I decided to modify a pound cake recipe that I found on the P.A.N. website. It’s a relatively quick and easy recipe that’s great for a brunch, or anytime. P.A.N. Cornmeal is such a versatile ingredient. It could work as a base for many recipes. I am glad I am getting to know it, and that it’s becoming a staple in my pantry. I know many people have used it for years, but it makes me feel like a food explorer! I am slowly but surely getting more adventurous in the kitchen. Grease your baking mold, and sprinkle with P.A.N. Pre-cooked White Corn Meal. Whisk eggs and sugar together. Add in vanilla and oil. Combine P.A.N. Pre-cooked White Corn Meal and baking powder in another bowl. Mix wet and dry ingredient together. Stir in chips. Allow pound cake to cool before removing from mold. I feel like I added way too many steps to the directions, because it was really a simple process. I will most like skip the chips next time. They fell to the bottom of the mold (which is the top of the cake) and didn’t give me the appearance I was looking for. However, if you like the added cinnamon sweetness, feel free to leave them in. The cake itself is quite sweet. The texture reminds me of cornbread more than a pound cake. Overall, it’s delicious if you like cornbread. Do you like cornbread? 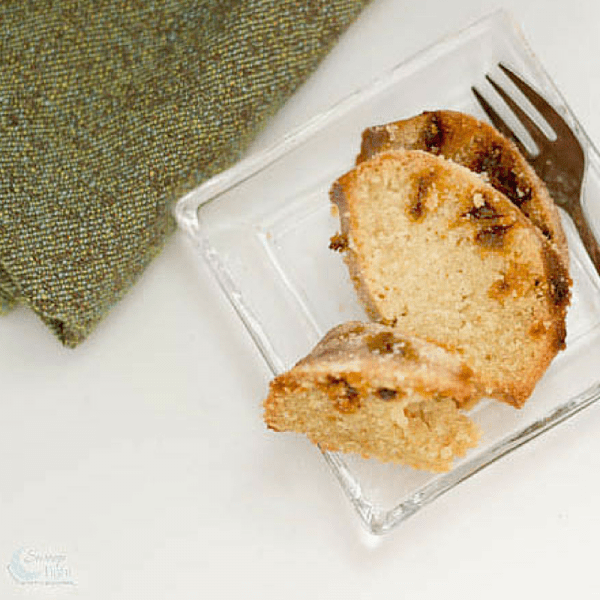 Do you think you would like this pound cake recipe? I didn’t know that you could make pound cake with cornmeal. It looks good. Yes I do like cornbread, and I would definitely like this pound cake. I still have not tried the cinnamon chips, I need to remember to put them in my shopping list. Thank you for sharing this recipe. I love cornbread! This looks really good and perfect for Sunday breakfast. I make the “big” breakfast on Sunday mornings just like when I was growing up. I had no idea that you could use cornmeal for this! It looks yummy… I’ll file it away in my recipe box! I love love your recipe. I’m really surprised i love all your ingredients especially the coconut oil instead of butter. This looks so delicious. I will have to try making one on the weekend. I am sure it will be a huge hit. For a second I thought it was churros pound cake. I love churros so the cinnamon and sugar reminded me of it. 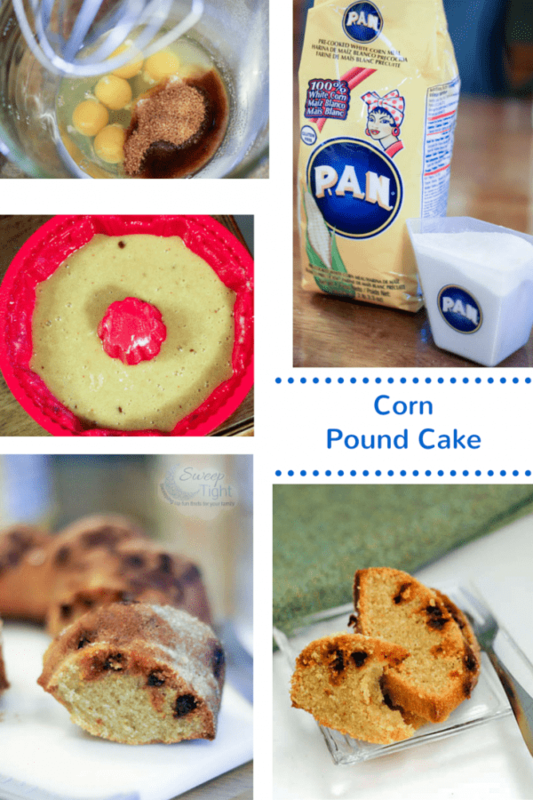 But I love the idea of Corn pound cake. I love corn bread so this si right up my alley! I love pound cake! The cinnamon chips look super tasty! Oh my these sound delicious! Cinnamon is definitely one of my favorite flavors. That looks like a yummy sweet treat! I had no idea you could use cornmeal! Oh my! That looks amazing! I love that you use cinnamon chips with the cornmeal. I love sweet and savory recipes! Ohhh, I love pound cake. This one looks so good, I love the use of corn, very unique! I modified the recipe from the P.A.N. website. I used their measurements, just used coconut oil instead of whichever oil they suggested. Feel free to visit their site and use their original recipe. I love Cornbread, and your recipe looks so delicious. I am going to make it for my family. The Coconut Oil sounds great in this recipe. Thanks for sharing. 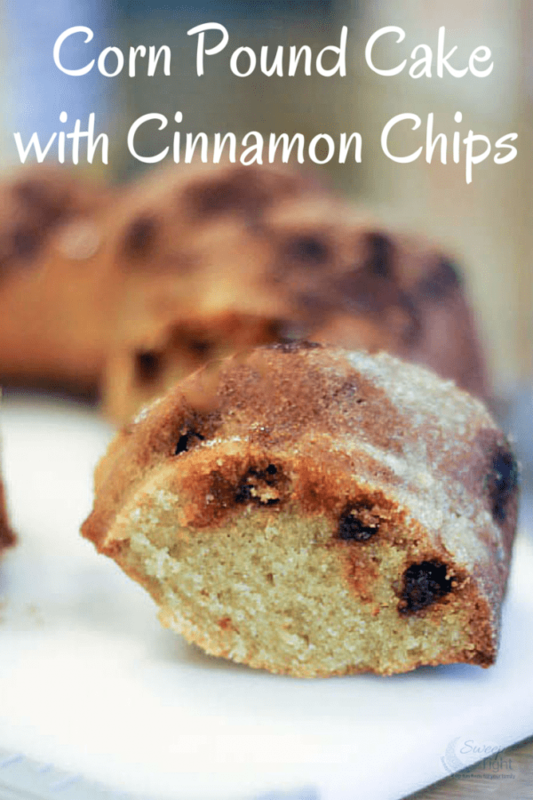 Cornbread and cinnamon chips is a great combination. Thanks.